The Pace University MBA program at Lubin School of Business is very flexible and classes are offered during the day, evenings and weekends. A typical evening course will run from 5:30 or 6 to 8:30 or 9 p.m. Weekend classes usually begin in the mornings and day-time courses meet at an array of times. Applicants are able to customize their schedule to include a mix of any of these options. Students finish the program at their own pace and do not need to enroll each semester so long as they complete their degree within five years. The Pace University MBA curriculum consists of up to 19 courses for a total of 39-58 credits required for graduation. The MBA in Accounting is the only exception, requiring between 53-72 credits. Students may waive up to four Foundation Core Courses—those that cover basic concepts in topics such as marketing, accounting, and management—by showing proof of previous academic study in relevant areas or by performing well on placement exams. Besides the seven Foundation Core Courses, the curriculum consists of fifteen credits as part of the Professional Core, 15 credits as part of a concentration, six credits as electives (seven for the MBA in Accounting), and a three-credit capstone course. Students may complete up to two concentrations in one of these areas: Financial Management, Information Systems, Accounting, Management, Marketing Management, Taxation, International Finance, and International Business. In addition, the program requires that students complete nine credits outside of their concentration and three of these credits must be in International Business. 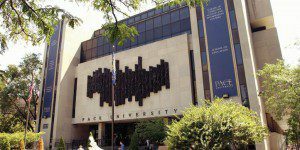 The Pace University MBA costs $1,230 per credit. Lubin offers merit scholarships each semester to outstanding students applying to the Pace MBA Program. All applicants are considered, and potential recipients are contacted during the application process. Award amounts range from $3,200 to $6,380 for one academic year. Full-time students, as well as international students, that receive this scholarship must take a minimum of 9 credits per semester. Those completing courses on a part-time basis must complete 6 credits per semester. Pace also offers the Mayor’s Graduate Scholarship Program for students that work full-time for a city New York City government office, agency, or department. Awards differ based on qualifications and applicants must attain an application from the New York City Department of Administrative Services. In addition, there are a small number of endowed and restricted scholarships available to Graduate students. They have specific criteria and current students are encouraged to investigate these options on Pace’s Application Portal. Lastly, the school also offers Graduate Assistantships to highly qualified students who wish to conduct research or complete administrative duties. These positions cover either full or half tuition and provide a small stipend depending on whether assistants are working full- or part-time. Pace encourages applicants to pursue student loans. Graduate students are eligible to borrow up to $20,500 per academic year in Unsubsidized Federal Direct Stafford Loans Graduate students can also borrow money equal to their cost of attendance through Direct PLUS Loans. In addition, the Federal Work-Study program can help MBAs earn money through part-time work. To learn more students should visit FASFA’s website. Applicants must submit official transcripts for all credits earned in undergraduate and graduate programs; two letters of recommendation; a résumé; a $70 application fee; and a personal statement that covers reasons for pursuing the MBA program and additional information regarding academic performance and work experience. Official GMAT or GRE scores are also required, unless: applicants have a cumulative GPA above 3.50 for all undergraduate work or already hold a business-related master’s or doctoral degree. The Pace University MBA requires international students to have taken the TOEFL, IELTS, or Pearson PTE exam within the past two years.